legalize urban chicken keeping in the U.S.
With the terrible reports of chicken abuse in the commercial egg and meat industries and recent salmonella poisoning and fowl pox outbreaks on the rise more people want to raise their own backyard chickens to ensure that they are treated humanely and to be able to control every step of the process from farm to table while other's have simply bought chickens, keep them as pets and love them just as they would any other pet. There are many cities which have already changed their ordinances to allow chickens to be kept as pets but there are still quite a few cities who refuse to budge. In a democratic society such as ours (U.S.). people can change city ordinances and even laws with letters, signatures and vote. We are petitioning to allow home owner's to keep chickens as pets inside city limits in every city in the U.S.
Click here to sign the petition to legalize urban chicken keeping in the U.S. If you live inside city limits you need to read this article about legal problems associated with raising chickens inside city limits. "This should be an easy decision. Properly kept, chickens won’t smell or raise a ruckus. As one letter-writer to The Sentinel pointed out, a pit bull a much greater threat to the health, safety and tranquility of neighbors than a handful of hens. Some planning commissioners said they were worried about the burden of licensing and inspecting coops. It shouldn’t be that bureaucratic and complicated. Give residents who want to raise chickens a conditional use permit and leave them alone unless neighbors cite a problem." 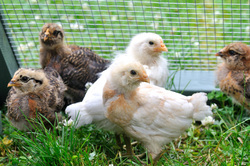 Read more..
As of July 1, 2011, OshKosh has decided to allow citizens to raise backyard chickens. With the recent trend for sustainable living comes the problem people are having with local city ordinances that prevent homeowners from having a 3 lb chicken in their backyard while many ordinances still allow pot bellied pigs which can reach a weight of 300 lbs and are very smelly. Chicken owners are uniting and joining the Backyard Chicken Revolution to find relief and many have been successful. The public is now being made aware of the problems chicken owners face in publications such as Backyard Poultry/The Chicken whisperer and Urban Chicks/Raising chickens in the city/ Mother Earth news. Public awareness and support is a viable tool used to impress upon city lawmakers just how important raising chickens are to the urban farmer seeking sustainable living. Laws are being changed all over the U.S. If you are having problems with your city, make preparations right away, make sure your chickens area is clean with fresh food and water every day. If the city is threatening to take your chickens you should Sign the Petition and Join the Chicken Revolution (link is listed below). Ordinance Proposed to Allow Chickens in East Peoria, Ill.